If Phoenix is Tezuka’s Ring Cycle, Wagnerian in scope, form, and seriousness, then Dororo is Tezuka’s Don Giovanni, a playful marriage of supernatural intrigue and lowbrow comedy whose deeper message is cloaked in shout-outs to fellow artists (in this case, Shunji Sonoyama instead of Vicente Martin y Soler), self-referential jokes, pop-culture allusions, fourth-wall humor, and a bestiary of bodacious demons. Its hero, Hyakkimaru, is born under a black cloud, thanks to a deal his father, Lord Daigo, struck with forty-eight devils: in exchange for political and military power, Daigo allowed each demon to claim one of his unborn child’s body parts. After his son’s birth, Daigo places Hyakkimaru in a basket and, against his wife’s wishes, sets the baby adrift on a river. A kind doctor rescues and raises Hyakkimaru, eventually building him a new body that transformed the legless, armless boy into a fighting machine equipped with an exploding nose and sword prostheses. It doesn’t take long, however, before Daigo’s minions begin attacking Hyakkimaru and menacing Dr. Honma. In an effort to spare his mentor’s life, Hyakkimaru bids farewell to Dr. Honma and embarks on a quest to reclaim his body from the demons who aided Lord Daigo. Hyakkimaru soon acquires a traveling companion: Dororo, a pint-sized pickpocket with a big mouth and a bad attitude. Despite Hyakkimaru’s efforts to rid himself of Dororo, the kid bandit vows not to leave Hyakkimaru’s side until he gets his hands on one of Hyakkimaru’s swords. The two wander a war-torn landscape, stumbling across fire-ravaged temples, starving villages, bandits, profiteers, homeless children… and demons. Lots of them. Though much of the devastation that Hyakkimaru and Dororo witness is man-made (Dororo takes placed during the Sengoku, or Warring States, Period), demons exploit the conflict for their own benefit, holding small communities in their thrall, luring desperate travelers to their doom, and feasting on the never-ending supply of human corpses. Some of these demons have obvious antecedents in Japanese folklore — a nine-tailed kitsune — while others seem to have sprung full-blown from Tezuka’s imagination — a shark who paralyzes his victims with sake breath, a demonic toad, a patch of mold possessed by an evil spirit. (As someone who’s lived in prewar buildings, I can vouch for the existence of demonic mold. Lysol is generally more effective than swordplay in eliminating it, however.) Hyakkimaru has a vested interest in killing these demons, as he spontaneously regenerates a lost body part with each monster he slays. But he also feels a strong sense of kinship with many victims — a feeling not shared by those he helps, who cast him out of their village as soon as the local demon has been vanquished. For folks who find the cartoonish aspects of Tezuka’s style difficult to reconcile with the serious themes addressed in Buddha, Phoenix, and Ode to Kirihito, Dororo may prove a more satisfying read. The cuteness of Tezuka’s heroes actually works to his advantage; they seem terribly vulnerable when contrasted with the grotesque demons, ruthless samurai, and scheming bandits they encounter. Tezuka’s jokes — which can be intrusive in other stories — also prove essential to Dororo‘s success. He shatters the fourth wall, inserts characters from his stable of “stars,” borrows characters from other manga-kas’ work, and punctuates moments of high drama with low comedy, underscoring the sheer absurdity of his conceits… like sake-breathing shark demons. Put another way, Dororo wears its allegory lightly, focusing primarily on swordfights, monster lairs, and damsels in distress while using its historical setting to make a few modest points about the corrosive influence of greed, power, and fear. If I had any criticism of Dororo, it’s that the story ends too abruptly. Neither hero has reached the end of his journey, yet neither seems firmly resolved to continue his quest; they simply part ways at Hyakkimaru’s suggestion. I’m guessing that Tezuka was avoiding the obvious, sentimental conclusion suggested by a major revelation in volume three, but even that would have been better than slamming on the brakes at an arbitrary point in the narrative. Weak ending notwithstanding, Dororo is one of Tezuka’s most accessible series, free of the historical and cultural baggage that can be an obstacle to enjoying his more ambitious, adult stories. 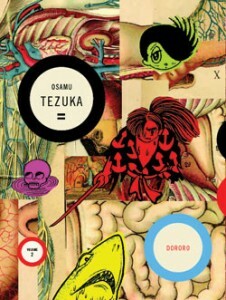 If you haven’t yet explored Tezuka’s work, have found titles like Apollo’s Song too fraught for your tastes, or are wondering why this somewhat corny, boy-versus-monster manga beat out critical favorites like Monster and solanin in this year’s Eisner race, Dororo makes a perfect (re)introduction to Tezuka’s unique storytelling style. Highly recommended. This review is based on complimentary copies provided by Vertical, Inc. for the purposes of a review. I have not received any form of compensation from Vertical, Inc. in exchange for publishing my opinion of this book. From what I understand, the ending was an editorial thing – Tezuka was moving onto a more important job and had to wind Dororo up super quick. I kind of like that he left it open ended, as if he might come back and pick it up again one day. 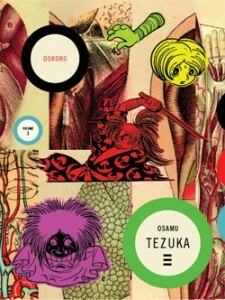 Dororo is definitely my favourite Tezuka work, although I hate the over-designed covers Vertical went with..
That would certainly make sense given how open-ended the conclusion is. I’m curious about the anime; from what I’ve read, it seems as if the producers decided to give the series that Tezuka never got around to doing. There was a live-action movie adaptation that came out a year or two ago, and it kind of followed Tezuka’s lead, wrapping up the plotline with Hyakkimaru’s father, but ending openly. It was all right, but I definitely would go for the manga instead. Thanks for the tip, Matthew. I remember seeing some articles about the film when it was released, and wondered why Dororo was being played by a female actor. (Hee!) I’m not sure if I’d rent it—I loved the artwork so much I don’t know if I want to see it realized with actors and CGI. My review of the final volume won’t be up until after I’m away in Philly (I’m stockpiling a few so that the blog stays active even when I can’t be tending to it), but I pretty much agree with you. From what I can gather, it seems like this was shut down early, which is a damned shame because it’s so good. I’m really glad Vertical gave it an English edition, even if it’s not “complete” in the way we think of stories being complete. Which hey, kinda fits the theme! I do think the cartoonish style fits the material best here. I’ve compared Tezuka to Warner Brothers in the past, and I could easily see Chuck Jones directing a short with the same type of setting, had they wanted to go more serious in terms of storytelling. Really nice summary of the three volumes! Thanks for the feedback, Rob! Much as love Tezuka’s “serious” work — Buddha, Phoenix, Ode to Kirihito — I have a special place in my heart for Dororo, too. I love your comparison to Chuck Jones, BTW; I think he and Tezuka would have made swell golf buddies. Will keep an eye out for your reviews!